Also known as hallux valgus, A bunion is basically a bony prominence at the base of the big toe. It causes pain, redness and rubbing against footwear. 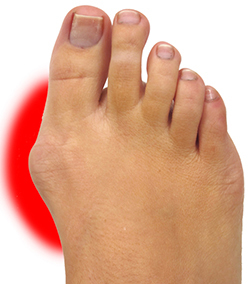 When this bony bump occurs along the outside of the foot at the joint of the little toe, it’s called a tailor’s bunion. A bunion can change the normal foot shape making it difficult to find shoes that fit correctly. Even though there is no consensus about the actual cause of why bunions occur, the most plausible causes include genetics or family history, arthritis, tight-fitting shoes, among others. If you are experiencing the above-mentioned symptoms, you may want to consider undergoing a bunion surgery to get back to your normal life. Some patients decide to undergo this procedure for aesthetic reasons. The overall goal of a bunion surgery procedure is to realign the bones in the foot, relieve pain and discomfort, and correct the deformity. Starting with proper IV sedation to prevent pain and discomfort, the bunion surgery procedure (called bunionectomy) consists of removing the inflamed tissue around the big toe joint. The process starts with an incision at the top of the big toe or along the side of the foot. Then, the surgeon will remove a portion of the bone so he can realign the big toe joint with the use of screws, pins, or plates. Bunion surgery can be performed on an outpatient since it is a minimally invasive procedure. This means that patients can go home the same day of the procedure expecting a faster recovery time and less risk of infection.